1. Would you introduce yourself for readers who are new to your work and tell us what got you into creating? I'm Ali, owner of alibalijewellery. I have shops on Folksy, Etsy and Dawanda. 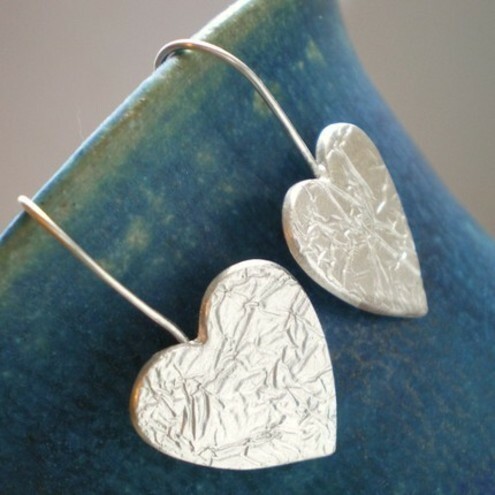 Working from my home studio in Edinburgh, I create a range of contemporary silver jewellery for women. I started making jewellery just over two years ago as a way of relaxing and the hobby quickly got out of control! 2. You make and sell a range of gorgeous jewellery, what are your favourite items at the moment? My favourite item is usually my most recent creation, but I think overall my favourite is my range of silver crochet bracelets. I love the sheer variety of styles I can create with these. 3. Are there any influences on your work? What and who inspires you to create? I admire the work of several Precious Metal Clay artists, a particular favourite is Hadar Jacobson, her jewellery is amazing! I love colour and so this features strongly in much of my work. 4. Describe your creative process - when and where do you like to work? Background music of choice? Company or alone? Snacks to help you along the way?! I am supposed to work in my spare bedroom/studio. I mainly work at my dining table though with music on in the background. I prefer to work alone, I get a bit bashful about creating in front of others!! 5. Where do you sell your work? Online I sell on www.alibalijewellery.folksy.com and www.alibalijewellery.etsy.com and www.dawanda.en/shop/alibalijewellery. I am also a regular face at craft fairs in the Central belt and Borders of Scotland. 6. How long have you been self employed? Oh... how I wish I was solely self employed!! One day maybe. In the meantime I'm actually an HR Project Manager for a global bank. 7. You kindly answered many a silver clay question from me, what would be your top three tips for those just starting to make and sell their jewellery? a) If you are opening an online shop, take the time to produce great photos of your products, have a look at other shops selling on the venue and see how they photograph their jewellery. You are unlikely to sell anything with poor photographs. b) Don't sell anything until you are confident that you have mastered the technique you are using. You don't want customers coming back complaining about faulty goods. c) Be realistic in your expectations. Don't expect to open your shop, sit back and wait for customers to arrive. Jewellery is a tough market, you will have to work hard to publicise your shop. 8. Do you have a favourite blog / website which inspires you? Hadar Jacobson again, fantastic website. I love reading the blogs of some of the other UK sellers on Etsy and Folksy. Autonomous Artisans is excellent! 9. Have you any suggestions for books which have helped or inspired you? To do with your craft? Sorry, I'm like a stuck record!! Hadar Jacobson. Tim McCreight and Sheri Haab do great Precious Metal Clay books which are excellent for beginners. 10. Do you have a motto? 11. Lastly (phew, I hear you cry!) would you be so kind as to let us know three of your favourite handmade sellers so we can all check out their work. www.lizardsjewelry.etsy.com features some amazing precious metal clay work! www.maggiecook.folksy.com does lovely handknitted clothing which I aspire to own! Many thanks to Alison for this contribution and for the lovely earrings! This is such a FANTASTIC approach to the 'purple cow' question. Really brilliant. I love that you asked everybody so in a way, it was constructive feedback. I also love how you have named your cow but I feel that I must add that even if your cow is 'complex' there is also a sense of balance and harmony with your designs that make all the different elements work together.